That lovely, earthy smell after the rain has a name: petrichor. Exactly what causes petrichor, however, is unknown. Armed with high-speed cameras, MIT scientists have found that the interface where raindrop hits earth is a little more complicated than you might expect. Every collision of raindrop with the ground is, in its own little world, a violent collision. "[W]hen a raindrop hits a porous surface," according to MIT, "it traps tiny air bubbles at the point of contact. As in a glass of champagne, the bubbles then shoot upward, ultimately bursting from the drop in a fizz of aerosols." That's the spray you see shooting up from a puddle of a water drop. It can generate up to hundreds of tiny aerosol droplets in a few microseconds. 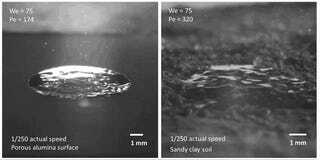 In the study published in Nature Communications, the MIT scientists looked at how raindrops fell onto 28 different types of soils and surfaces. The amount of aerosols can be predicted based on the speed of the raindrop and the porousness of the surface.